Pakistan was born out of British India. Initially, British India was to be given its independence as 1 land, but with India being majority Hindu and Sikh, the Muslims felt that they would be in such a minority, that their ability to live the way they wanted to would be under threat. So, towards the end of the independence movement in India, Britain decided to grant independence to 2 nations. The large bulk of it would comprise India, and then the Muslim majority areas on the west, and an enclave in the east, was given over to the new nation of (East and West) Pakistan. Pakistan enjoyed long periods of instability, and military rule. Also, it suffered civil war, with the east Pakistani community (backed by India) breaking away from Pakistan. The flag itself came from the flag of the All India Muslim League, which used a green banner, on which, in white, where a 5 point star, and crescent. 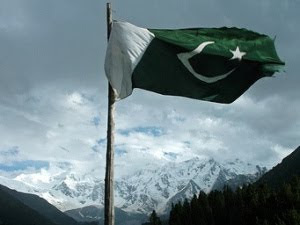 Upon independence in 1947, the flag was adopted as the new flag for Pakistan, with the addition of a white stripe along the hoist of the flag to symbolise the other minority religions in Pakistan. The green represents Islam, along with the star and crescent. The white represents the ethnic minorities in Pakistan. Also, the green and white represents peace and prosperity, the crescent represents light and knowledge, and the star represents progress.